Actors Robert De Niro, Sally Field and Mark Ruffalo joined hundreds of other people in front of the Trump International Hotel and Tower on Thursday for a pre-inauguration demonstration organizers said was meant to energize those concerned about the Republican president-elect's policies. The event, staged near Central Park in Manhattan, was a rally for city residents who have vowed to pursue their own policies on health care, the environment and other issues during the Trump administration. The mayors of Minneapolis and New York attended. "We can't just mope," said Bronx resident Jawanza Clark, who attended the gathering with his two sons, ages 10 and 5. "I want to give them a sense of the America they're inheriting, the fact that they have to lift their voices up." Civic-mindedness was a theme throughout the evening. Movie director Michael Moore urged people to regularly call their representatives in Congress. And actor Alec Baldwin, who portrays Trump on NBC's "Saturday Night Live," said Americans wary of Trump's policies should become more involved. Baldwin briefly did his Trump impression, which has drawn barbs from the president-elect. Among the groups that helped organize the event were Greenpeace, Planned Parenthood and MoveOn.org. Some mayors, including New York Democrat Bill de Blasio, have made a point of defying potential Trump policies. But a Quinnipiac University poll released Thursday shows New Yorkers are split on how de Blasio should deal with the Trump White House. Forty-six percent said de Blasio should try to get along with Trump, while 45 percent said de Blasio should be a national leader in opposing Trump's policies. Trump, a billionaire New York real estate mogul, was in Washington, D.C., where he's scheduled to be sworn in Friday as the 45th president. 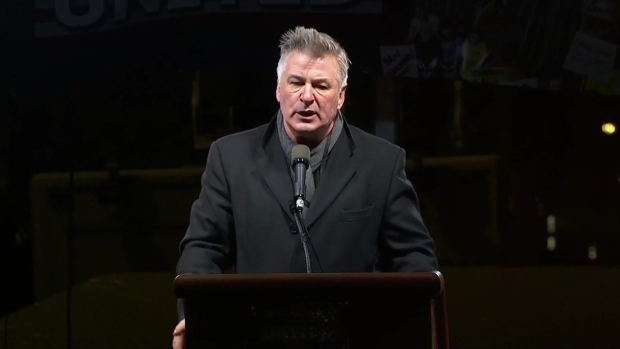 Rosie Perez, Robert DeNiro, Alec Baldwin, Sally Field, Mark Ruffalo, Shailene Woodley, and Cher were among the celebrities, officials and leaders who spoke at the Unity Rally near Trump International Hotel at Columbus Circle on the eve of the presidential inauguration. He won the election in part through his vows to pump up the American economy and end many liberal policies of the outgoing Obama administration.